Michael Evans, 39, a husband and father of two young children, was diagnosed in 2014 with Acute Lymphoblastic Leukaemia. “My energy had been very low for two weeks before my diagnosis; I had a tooth infection, and I had started to lose the feeling in my top lip. I went for blood tests at Weston General Hospital and by early afternoon that same day I was handed a letter telling me I had suspected leukaemia. I’ve never felt so helpless. So scared for me, my wife Helen and my two young children. Tests at the Bristol Oncology Centre confirmed I had a rare form of leukaemia called Acute Lymphoblastic Leukaemia, which is a cancer of the white blood cells. Simply put, it impacts your body’s ability to fight infection. 98% of my bone marrow, which produces your blood cells, was cancerous, along with leukemic cells in my spinal fluid and bleeding on my brain. After two months of intensive treatment I was completely wiped out. But I was lucky to have my amazing wife Helen, a wellness practitioner, and Mike and Pauline McGinn, who provided nutritional and chiropractic support – with the blessing of my doctors – which helped my recovery. In August 2014, I had a bone marrow transplant from my brother, James, which gave me new, healthy cells to produce blood cells, without which I wouldn’t survive. The transplant was deemed successful and in December 2014 I was classed as 'in remission'. However, I relapsed in July 2015. The leukaemia had infiltrated my heart, one of my kidneys and the muscles in my right eye and I was given a terminal diagnosis, two months to live, with a new chemotherapy treatment as palliative care”. Michael was advised by his doctor to make the most of the time he had left with his wife and two young children. Yet defying all the odds, three weeks later the doctors couldn’t find any trace of leukaemia. But his prognosis remains fragile with the likelihood that the cancer will return, which is why it’s so important we keep funding life-saving research. “I can’t stress enough how important it is to raise funds for Leuka and the research they support – to find guaranteed cures, not just possible cures. If it wasn’t for research, which Leuka funds, I would never have been treated with a bone marrow transplant, or chemotherapy. There are over 200 different types of cancer. Each needs a different approach to stop it. A different drug or therapy. It’s organisations like Leuka, given the right funding, that will come up with the treatments to stop cancers. 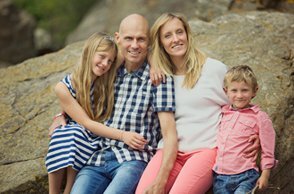 To stop people like me having to go through such horrible treatments, families being devastated with so much stress and to give us certainty to take away the wider impact of cancer." Michael’s story was featured in our 2015 Annual Review, which you can download here.